I found this picture on the internet. Google links it back to ectmmo.com – so credit to them, I suppose! I have now had experience with all six of the raid bosses that are currently available, as well as the two world bosses. As I have approached raiding this expansion, it has been with a love/hate relationship with my mana bar. And by love/hate, I suppose it’s probably more like a 20/80 split. There have been so many times that I’ve approached the end of an encounter cursing that damn blue bar. Cursing the raid wide AE damage pummeling the raid. Cursing my relative inability to efficiently deal with it. And one night, as I was trying to squeeze out one more spell at the end of Elegon, in hopes that it might keep someone alive long enough to do just a tiny bit more damage, I couldn’t help but wonder: who decides what makes healing fun? I mean, I know that the devs are invested in making the game engaging for everyone. But as we are immersed in yet another healing paradigm change I once again revel in the shortcomings of our toolkit, that are always highlighted the strongest when mana is an issue. But I don’t necessarily want to talk about how Mushrooms fell flat, or how Rejuv is still our way to get a raid topped up in high damage situations, and is so expensive that it’s laughable to think it can be effective – which means you have to throttle the one of the only tools you have to work with in those situations. Rather, what I want to think about is why the devs seem to always go back to “making mana important” or why making your mana pool so tight that it’s borderline frustrating to work with equates to fun. There are a lot of things about healing that I enjoy and would say make the game engaging and fun for me (hint: struggling with mana constantly isn’t on the top of that list). I like the constantly changing dynamics of healing. I like the awareness that is required to be a good healer. I like that my reaction time could be the different between the life or death of one of my raid mates. I like figuring out the best times to utilize certain tools like Tranq and ToL in an encounter. I like trying to find creative ways to use my toolkit to enhance my performance. But at no point do I like losing a member of the raid because I lack the mana at the end of a fight with constant damage to continue to heal (and granted, the shortcomings of our toolkit are an extension of this problem for us that make it more obvious). 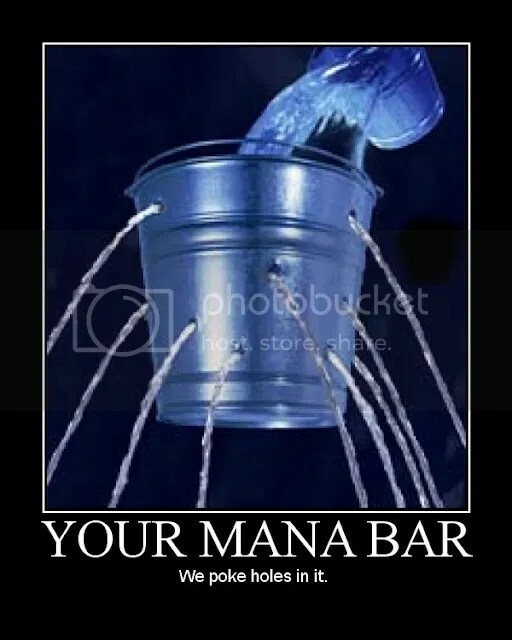 I don’t like that I have to consciously try to monitor my spell selection so I have enough mana to push through burst sections of damage to see other healers with almost full mana pools laugh off those sections of damage that I’d been so preciously hoarding my mana for (I’m looking at you SCK and Healing Rain). And I guess while I’m here, I should toss out another obligatory I don’t like that early encounter dynamics again appear to be inconsistent with the amount of healing (and subsequently the number of healers) needed to succeed. Which, at this juncture, I think is more a reflection on the new healing paradigm and what it is realistic to heal with our new, static, mana pools. I don’t really mind having to keep an eye on my mana and make smart spell selections, but I think it’s fair to say that I also don’t like having it be so constrictive that I can’t effectively utilize the tools available to me to be successful either. Whether this is primarily a toolkit issue or a mana paradigm issue, I’m not entirely sure yet. Likely it is a combination of both. But in either case, I can’t say that the recent changes have made the game more “fun” for me as a healer. If anything, I’m probably a little more frustrated at the holes in our toolkit, and exasperated that they have, yet again, been ignored – which is only highlighted by the new constraints on our mana. So how would I fix healing and make it “fun”? I guess I’m not entirely sure that I’d do it exclusively via our mana bar. I do think that there should be consequences to just mashing buttons mindlessly; but I also think that sometimes limited mana takes trying to make spell selection engaging a step too far in the other direction, to where the limitations actually hinder some of your freedom of making dynamic and interesting choices. Which, in turn, makes healing less interesting and less fun. Or maybe it’s just me that feels this way – after all, I did spend the past week untraining myself from casting Nourish as a filler and chanting “careful with those rejuvs” in my head every time burst damage hit the raid. I suppose the question that needs to be resolved, and that is likely being tossed around in boardrooms as blizzard, is how to make spell selection meaningful. It’s clear that so far that the conclusion has been to restrict the resources required, but I think in a way that is somewhat counterproductive. Rather than making healing more dynamic, it often stifles the ability to make interesting choices. And, honestly, I’m not really sure how to balance the meaningful choices vs. resources problem. I just know that right now I feel a little bit like it is off balance towards the resource side. What I do know is that being frustrated with my mana bar every raid isn’t particularly thrilling. Knowing that the abilities I do have drain too heavily on my resources for them to be as effective isn’t overly fun. I’ve healed every expansion since Vanilla, and my glasses aren’t rosy enough to say each expansion didn’t have its problems. I think the worst was probably the unending mana pools and mindless blanketing that was WotLK, but I’m not entirely sure that what we have now is better. Somewhere there has to be a middle ground. Somewhere there has to be the ability to enforce meaningful choices without making healers want to scream after every raid. Perhaps the answer could be found in the in combat mana regen model. What if spirit did more for us? What if we could dictate when we needed more mana and when we needed more throughput? Stay with me here as I go off the deep end! What if we had something similar to that hunter aspect that caused you to generate resources more quickly, at the cost of how much damage you could do in that aspect. We could call it “meditated states”. When we are in a meditated state our regen increases, but our throughput decreases. This gives us the opportunity to be more active about when we want to regenerate mana. And going back to the days of “healing rotations” also offers the opportunity for team work, where you can rotate who is going to take the throughput hit in order to have a period of regeneration. My thought in this is that it allows you to maintain the ability to make a plethora of selections with your toolkit – but also means that you have to monitor those choices and make meaningful selections, because being in a meditated state isn’t ideal. However, you are also not irreparably harmed when you have periods of strong healing – or heal like an idiot – because you have another meaningful choice to make: entering a meditated state and increasing your regen to prepare for the next period of burst damage. With this thought, people who heal smartly will have to spend less time in a meditated state, and will be stronger performers while retaining their ability to make meaningful spell selections. Those who don’t heal smartly won’t perform as strongly because they will be forced to spend more time meditated, and will either have to learn to be smarter with their choices – or accept they will never be an exceptional healer. In short, this puts a lot into the healers hands, without the finite “if you run out of mana, that’s it, game over” mentality of having everything tied solely to running out of mana. And, in my opinion, has the possibility of being more engaging and more involved for the healer because it lets them, rather than the game, make decisions with regards to their mana. I don’t know if it would work, but I do think it would be more engaging and more fun that what we have right now. What do you think? Do you like the thought of meditated states? What would you do to make healing fun? I am less a veteran of raiding, healing, and WoW expansions than yourself, but I have to agree with the “OMG, where is my mana? !” feel that seems to accompany healers into the start of each expac. It is why my Shaman is currently sitting at 85 with an unknown future and no expansion as of yet. I went through the hellishness that was the start of Cata as a Resto Shaman, and I am anxious to face it again. I like the “aura” or “aspect” idea, but I have to admit, it makes me sad. Shaman had a similar mechanic with their Telluric Currents throughout Cata. But it has apparently been taken away from us and is the source of a moderate amount of my trepidation. Telluric Currents was what got me through many of the heavy healing fights in Cata. It allowed me to panic heal, then afford myself a few scarce seconds of recuperation time. I was hoping they would realize what a wonderful addition to our toolkit it was, and how it made Shaman healing feel more dynamic. I could not lightning bolt all fight, or heavy heal all fight – I had to time things just right. But I could handle those AoE OMG everyone is taking huge damage periods and occupy myself with something other than staring frantically at my creeping mana bar during burst damage periods. I think the dynamics of Shaman healing later in the expansion was what got me through the many many months of raiding Dragon Soul. Shamans do still have a Telluric Currents glyph, though it’s a bit different. I’d like to be a rogue healer. (Maybe I should reroll monk.) In the doldrums before MoP, I spent some time in The Secret World. I loooved it. Almost didn’t come back to wow. Shockingly, I spent time experimenting with the healing styles there. Instead of a blue mana bar, full at the start of a session and oh so frustratingly empty after the first time the encounter hits the fan, in TSW healers have 2 of 3 kinds of resources, depending on which 2 weapons they equip. For each of the 3 kinds, you have builders that generate a resource and a consumer that uses it up. I liked it so much better than a blue mana bar. You had to make informed choices on when to just use your healing builders, when to use them at a partially full resource, and when to go for a big bang consuming a full bar. (I also liked that standing in the bad almost always meant instant player death…) The interplay of 2 resource bars to build and use also made the choices interesting. I would like to know who still has mana though? My healing team is chewing through their resources at the same rate I am. I really enjoyed the challenge at the beginning of Cata, when Rejuv was expensive, WG was weak and Tranq was still on 8 min CD. Pugging heroic dungeons used to take *hours* and we wiped numerous times, but I love the process of choosing the *right* spell (right in terms of the amount it heals, mana cost, and the nature of the spell), and never enjoyed SM & WG on CD type of healing. If we wipe due to me going oom, I would go back and analyse & re-work on healing strats, and when we do get a kill – it feels great. What constitutes *fun* really depends on healer personality – those with competitive streak love pulling big numbers and topping the chart; strategists (like myself) love working with restrictions and limitations; others may be happy just keeping people alive and getting a kill + new gear. Due to real life commitment I haven’t been able to level fast so I haven’t had a chance to raid at max level in MoP, but from what I hear mana is really tight and I’m really looking forward to raiding this tier. It wouldn’t feel smart to use Nourish when at the end of the encounter you have mana to spare. I’m with you on this – I love the period at the start where mana is really tight because it really challenges me to get the absolute best out of what I have to work with. I have to utilize every single mana cd I can come up with, every time it’s available, in order to ensure my mana lasts. And even then, if people screw up a lot and take extra damage, you’ll usually run out and wipe. Which is good in my opinion, because a kill shouldn’t be a kill just because the healers carried people with bad raid awareness. At present (working on 5th boss) I find all our healers mana pools run out at very similar rates. I’m quite happy with how it’s looking, although the different numbers of tanks/healers required for each boss is a bit annoying. I’ve gotta agree with the people here. I know when you are upset about something, the last thing you really want to hear is people disagreeing with you, but personally I love the new healing style. My guild is 6/6 already, and I was one of our main healers though out. I found that when I reverted back to my DS style of healing, I went OOM, and we’d eventually wipe. But when I consciously went about conserving mana, with lots of Nourish spells, and less WG and Rejuv spells going out, I found that the fights were engaging and fun. One of my favorite things about this heal style is that it limits overhealing by a lot. You really are depending on your other healers to do their jobs and I find that less and less of my Rejuvs and WG hots are being heal sniped from under me by our Resto Shaman or Holy Pally. They know that I will place HoTs on targets and are okay with leaving a dps at 75% hp because they know my hots will heal them to full. As for your Meditative states… you just described priests Inner buffs. They have Inner Fire which gives them more Spell Power (throughput) or Inner Will which gives them a decrease in mana cost on instant cast spells. And when I healed on my Disc Priest there were times that I would rotate between the two of them. It’s not a bad system, but for me, it feels clunky and a bit off putting to have to switch between the two. All in all, I am sorry you are not enjoying your raiding experience as much as you’d like and I am sorry that you are having mana issues. I hope, in time, these problems work themselves out for you and you get back to enjoying the game the way you did. And if not, then you can at least look by at these last 8 years and smile and enjoy the good and the bad of World of Warcraft. P.S. I’ve actually been utilizing the healing mushrooms. I know you and I had a personal talk a few weeks ago about the wow forums and getting Blizzard to help us with the shrooms. And while I still think they are underpowered, I have found a lot of use for them in fights like Spirit Kings and Elegon. Spirit Kings I use them a lot during the shared dmg swing mechanic (the first phase of the fight) and Elegon I use them right after the small add explodes, with WG and Efflo already on the raid for the pulsate. I am in favor of mana restrictions too. The alternatives that I experienced so far – either healing being really easy or having to react within very short time (I hated this in ICC) – were something I didn’t like. At all. As for regen mechanic, I’d rather see something like old judgements or TC – use a skill, get some mana back. I haven’t played yet but I heard priests got a skill like that too (PW: Solace), I’m not sure about druids and monks though. The other issue with making resources less constrictive is you then return to the Wrath style of healing, which is spam your best spell because resources don’t matter. The difficult part with the model in Cata was that we pretty much went back to the Wrath model (less severe, granted. Most tanks didn’t die in 2 GCDs if you weren’t spamming your biggest heal, unlike in Wrath) by Dragon Soul, which is what static mana pools are supposed to help prevent to a degree (to stop the exponential increase in available resources and make it linear). By making the entire fight count, rather than just the ten seconds before and ten seconds after this exact moment in time, you add a level of complexity to the game that rewards thought rather than reflexes. Given the chance, I would not go backwards. Each expansion has added a level of strategy and complexity, and dare I say, at least to me, fun to healing in general. It always comes down to resources, be it mana, cooldowns, another energy bar, etc. and what can you do with those resources. How about a mechanic similar to that of the mage’s Arcane Blast/Arcane Barrage for Rejuv whereby each successive cast increases mana cost but also increases healing done and adds to a stacking “debuff” on caster which could be cleared/reset by time decay or by casting something else (no idea what at this point RG? HT? SM? Would have to be something with a cooldown that we’d want to cast so I’m thinking probably SM). This resets the debuff and give a benefit of increased mana regen based off of the number of stacks you had of the debuff. Properly balanced this could be a way to toss out multiple rejuvs when needed and trigger the reset effect strategically to regain mana. Variations: 1. Instead of increased regen it could shorten the cooldown on Innervate. I thought the fixed mana bar was a rather elegant way to move healers away from int/haste and into spirit/regen. With enough regen, you can (theoretically) get to the point where you never run out of mana — just as if you’d grown your mana pool to handle a fight without sucking wind. I don’t think it’s fun to feel gimped. We felt this when Cata launched and spells were expensive or slow. We were forced to triage and it feels like we’re back there today with a slightly different spin. Pingback: [Links] Gaming ethics, Trolling trolls troll each other, and flimsy excuses to post a cute red panda picture « Welcome to Spinksville! Yeah I agree entirely, beginning of expansions always seem hardest on healers and that in part is because our tanks take too much damage and our DPS fail to put out big numbers and yet we’re the ones suffering for their shortcomings with a lack of fun. Why is it that the resource issue is a non-issue for DPS and tanks and it is only healers that get gimped this way (OK maybe Arcane Mages have the same problem)? I think they should either shorten the cast on healing touch or make it heal for more, buff mushrooms – like maybe have it refresh all hots on people who get hit by them, cut ironskin duration in half and double its effectiveness, and make our dps spells free and hit harder so we can do something meaningful when conserving mana.